Since I heard a Rodizio Rico's branch had launched in Birmingham, early last year, I was counting the days to visit the place. To start with, it's the perfect opportunity to have the famous Brazilian barbecue - which I had been craving since I have left my country two years ago. Secondly, Birmingham deserves an authentic Brazilian Steakhouse with a good reputation and Rico seems to get the "spirit" without the usual appealing for football and/or samba tricks. I've finally visited Rico with my husband some weeks ago and it was quite straightforward to book a table, even though it's usually a very busy establishment. Placed on the ground floor of The Cube, in the Mailbox, Rico it is a quite charming and spacious restaurant with decor inspired in the iconic patch of Copacabana beach and some other elements of the South American country. As Brazilian steakhouses are very popular around the world but also have a peculiar way of serving the food, the staff at Rico's make things fairly simple to understand and experience. As soon as you're placed on the table, you receive a red and a green card which are going to be used whenever you decide to start eating. Green means they can bring on the food while the red one is an indication that you are stuffed, so you need to stop eating for a while. And believe me; you will struggle! … But for a good reason. I do recommend you just having a light bite before visiting this restaurant because there is a variety and quality of food on offer. It's also better to start in the salad bar where you're going to find much more than green vegetables. 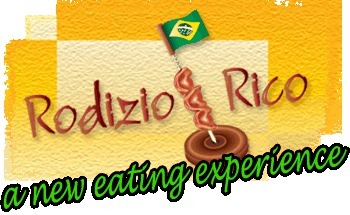 There are plenty of samples of typical Brazilian food and at Rico's, you eat as much you want. As starter I couldn't resist some pães de queijo (a Brazilian cheese bread); that's one of the most delicious appetisers my country produces. Ready to immerse in the barbecue experience, the waitresses/waiters -also called "pasadors"- started to serve the selection of meat cuts (basically a huge range of grilled meat, from poultries to pork and chicken sausage) as soon as we turned the green cards on. Picanha (rump cap steak) is my weakness and I could definitely say I felt like being back to Brazil as soon as I tried it. The food is absolutely delicious! As my other half was trying steakhouse for the first time, I had alerted him that it was important to try small portions and even though I am familiar with it, I had to use my red card for a couple of times. Especially when you're also keen on trying some typical Brazilian drinks, such as the internationally famous caipirinha. There are so many things to try and I just wish I had more room to try some of the wonderful desserts. Maybe next time! Even though it's a typical carnivore treat, Rico also caters for vegetarians. So, I wouldn't be afraid of introducing this restaurant to all friends and family. The experience was really pleasant and as Portuguese was the language spoken by most of the staff, I had also the privilege of meeting really nice people that made me, once again, very proud of this Brazilian restaurant being part of Birmingham's gastronomy map!